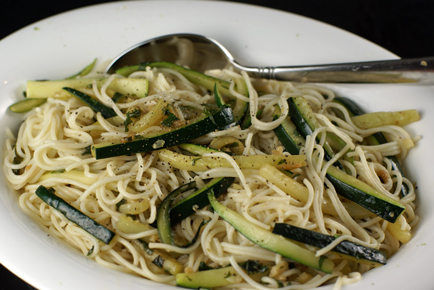 Angel Hair with Julienned Zucchini – Grow. Eat. $ave. 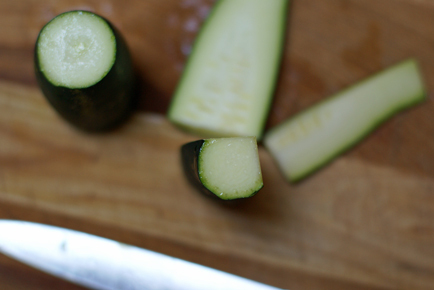 The good news is…the farmer’s market has zucchini for as little as $.50 per zuke! And you might even find an amazing deal like this one too! 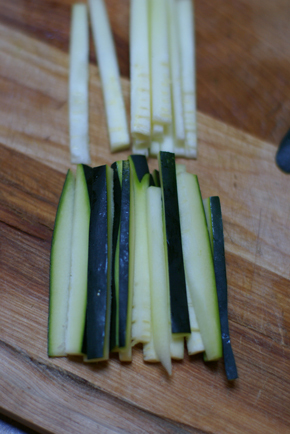 Last summer Amy compiled quite the list of zucchini recipes…if you are looking to try something new, I highly recommend checking her zucchini recipes list for some ideas! 1/2 cup grated or shredded parmesan cheese ($.50)…a great way to make this a one-dish dinner! 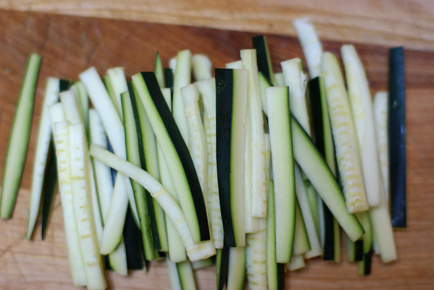 The Julienne is a 2 1/2 inch long and 1/8-1/4 inch wide cut on vegetables like carrots and zucchini. 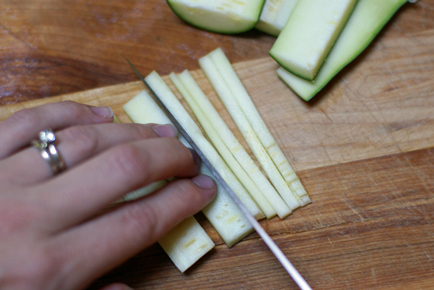 It is typically done after peeling the veggies…but as you can see, I like to include the green skin in the julienne cuts. For the color, and the nutrients! 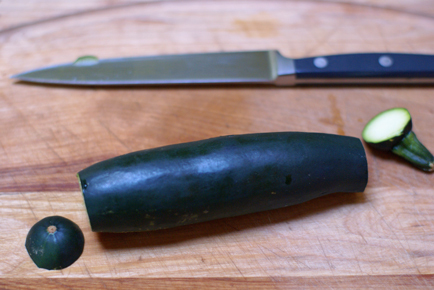 Chop of the head and tail of the zucchini. Cut into about 2 1/2 inch long sections. Cut off the green edges, creating a square…as best you can! 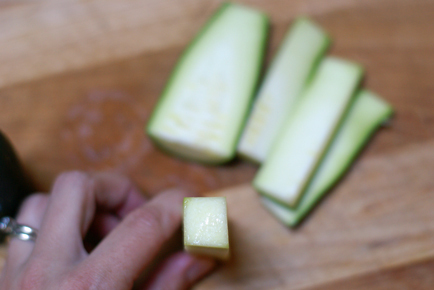 Cut the square into 1/8 inch wide slices. 5. Then slice those slices into 1/8 by 1/8 inch pieces. There…it’s julienned. Simple, right?! Make similar cuts to the green skin pieces. 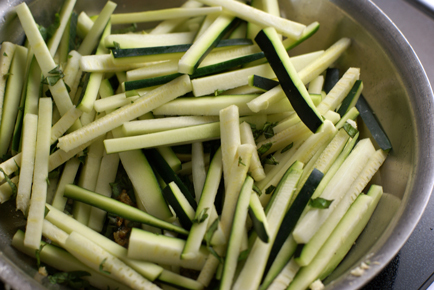 Pile high the julienned zucchini. 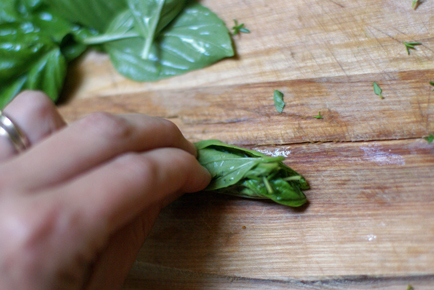 Wash and pat dry the fresh herbs. 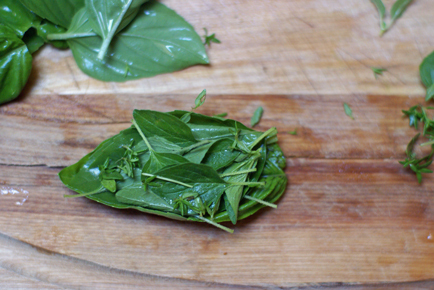 Place the smaller herbs, like the thyme and oregano leaves, inside the larger leaves. 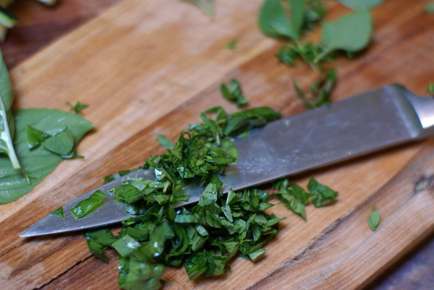 Roll up like a cigar and run a knife through the fresh herbs. Peel a large garlic clove…or 2 smaller ones. 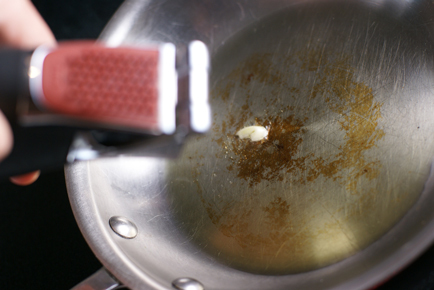 In a small or medium skillet, heat the olive oil for 2-3 minutes, then crush the garlic into the oil. 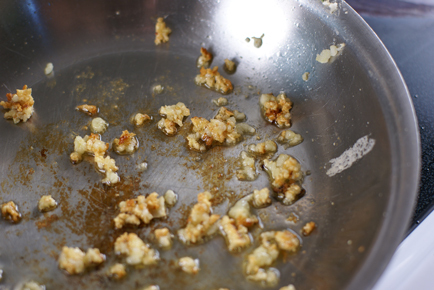 Saute the garlic for a little less than a minute, or until begins to brown. And make your house smell like food heaven. 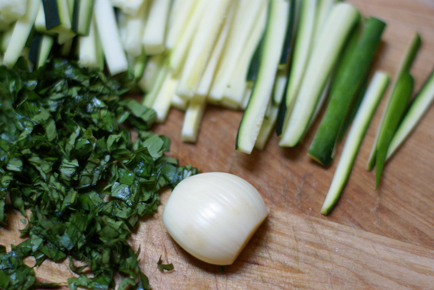 And toss with the fresh herbs and sauteed garlic. Season with a little salt and pepper. Let saute, stirring often, for 4-6 minutes, or until begin to turn opaque and some turn brown. 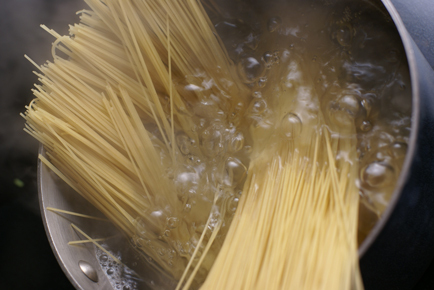 While the zucchini is cooking, prepare the angel hair pasta in a saucepan. Be sure to separate it well. 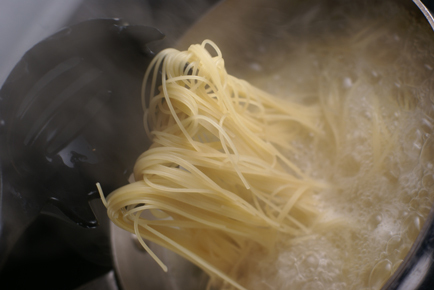 Angel hair is famous for clumping together!!! Drain pasta when finished cooking. 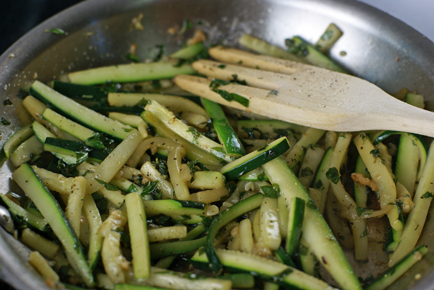 Toss the cooked pasta with the sauteed julienned zucchini. Season with salt and pepper. I don’t have any zukes yet on my plant, just tons of flowers. Hopefully soon. With the amount of flowers that have, I’ll be able to feed my entire neighborhood. This dish looks easy and tasty and I’ll use the zukes that I have from my CSA. Ooh, I think I’ll make this tonight! Thank you! A friend who lives a mile away has TONS of zucchini and our plants have a couple flowers but otherwise are looking kind of puny. I’ll be supporting her farm stand this summer if mine don’t make it! This is perfect timing! I just got my first zucchini in my CSA share. Your zucchini pasta dish looks great. I used the grilled zucchini in a pasta dish the other day and it was so good. I’ll be posting that recipe later this week. This looks wonderful1 I friend just suggested to me a few weeks ago that I cook pasta with veggies and I have enjoyed it so much that I have been looking for new ways to try it. My garden is coming in slowly so I linked up with a vegetable lasagna that is layered with zucchini. Sounds delish! Off to check it out! 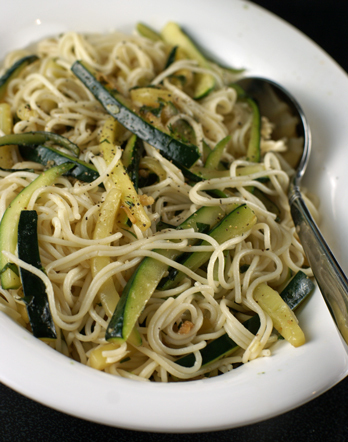 The zucchini pasta looks yummy, bet it would be great with shrimp or chicken breast too. Was visiting my aunt the other day and she had made zucchini jelly. It was very good! Don’t know if anyone here has tried it but you boil your zucchini and you use any flavor of jello for the flavor. I got to try raspberry and orange and they were both awesome. I just realized I have no idea what state you’re in. Ohio seems to be bursting with vegetables this year! Too bad you don’t live closer to us in Ohio. We have been getting 8-10 zucchini a day and sell it in front of our house for 25 cents each. The people in our town love it and or grocery budget likes it too. Thanks so much for your great recipes! I have a hard time finding recipes in cookbooks that fit our style of eating but I find that I print out lots of your recipes! If it persists, you can also try 1 tablespoon baking soda to a gallon of warm water; BUT, I’ve been warned that baking soda can kind of “burn” the leaves, and if you overdo it can wreck the pH of your soil. This recipe looks awesome! Thanks! Made this last night and had the leftovers for lunch today, definitely a keeper in our house my family loved it. I added a little butter to the garlic and oil and grilled chicken breasts with McCormick Chicken Seasoning. So delicious! YUM! So glad you enjoyed it…chicken is the perfect addition! 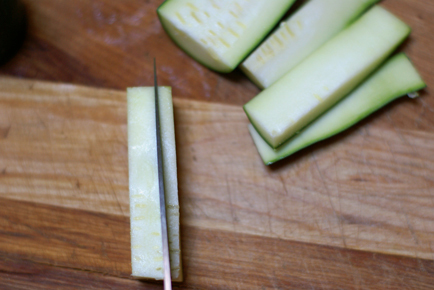 Nothing says summer like squash & zucchini. I love finding new ways to use them. I will definitely be trying this soon. This is one of my wife’s favorites. With all the rain we’ve had here in midlands of SC, we should have had a bumper crop. We were inundated, however, with stink bugs; which pretty much wiped us out: And a lot of the local farmers as well. 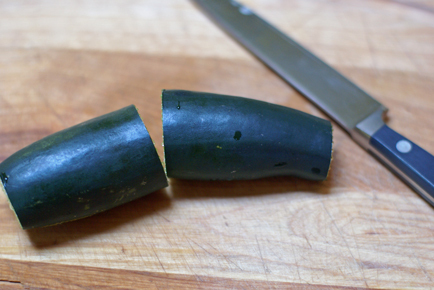 I was really, really, really looking forward to putting up some zucchini pickles this year. They’re the next best things to the Kosher dills I grew up with in NYC.